Mortech recently announced a new integration with Daric, a point-of-sale and application automation system. 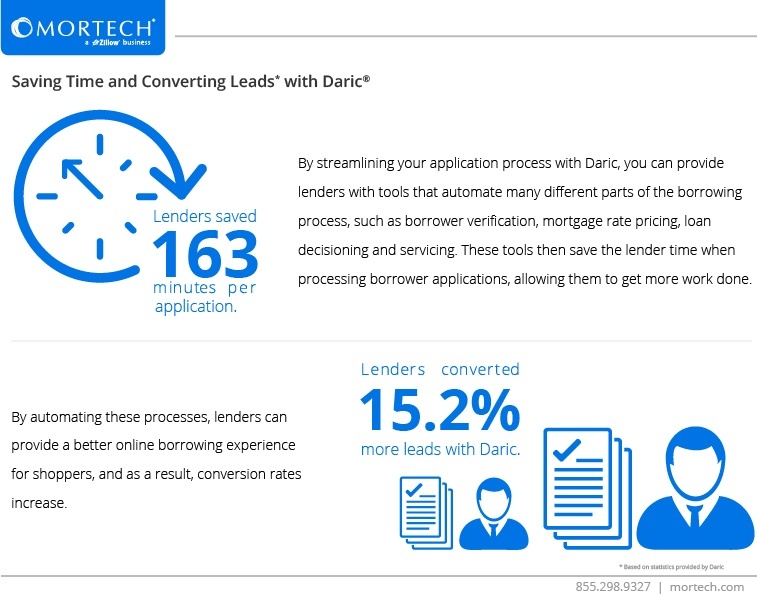 Combined with Mortech’s ability to provide customers with updated, accurate rate information, Daric provides borrowers with tools that help them automate much of the borrowing process, and streamline the mortgage process for both lender and borrower. This integration will make the entire process easier for lenders, saving them time, and helping them convert more leads. Users within Daric’s automated application system saved an average of 163 minutes per application submitted. This is largely due to the number of provided tools, mentioned above, that streamline the application and borrowing processes between lender and borrower. By streamlining your application process with Daric, you can provide lenders with tools that automate many different parts of the borrowing process, such as borrower verification, mortgage rate pricing, loan decisioning and servicing. These tools then save the lender time when processing borrower applications, allowing them to get more work done. Furthermore, by automating these processes, lenders can provide a better online borrowing experience for shoppers, and as a result, conversion rates increase. Lenders using Daric’s system converted 15.2% more leads. By saving time and providing your borrower tools that help them through the process, it’s not a surprise that conversion increases, due to an improved overall borrower experience. But don’t let these statistics be the only thing that convinces you, find out for yourself. Contact us today to see this new integration in action, and learn how you can begin saving time and converting leads.